CDR Technical Services Ltd carry in stock an extensive range of Unitrol 7000 seires interchangable spare parts and accessories. The 7000series Gas Valve is proferred by many OEM customers for the flexibilty in changing a number of components on the Valve Body, instead of discarding the entire valve. This is also a benefit to engineers carrying out repairs and general servicing. Accessories: Thermostat or Thermocouple Magnets - designed with internal thread to ensure correct thermocouples or thermopile is used. Magnets are slotted to accept interrupter leads. Governor (Regulator) - Add on pressure regulator kits are available for the Unitrol series (except hydraulic models which have regulators built in). Each type provides "straight line" regulation features. Kits include gasket, mounting screws and instructions. 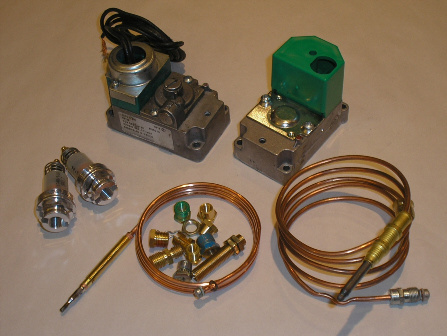 Replacement Operators - The Unitrol gas valve has components that can be readily exchanged. It is essential when replacing components the the procedure instructions are adhered too at all times. Control Knobs - A variety of replacement control knobs/dials are available. Blanking Plates - Used in place of Governor where governor is required. ie, were pressure is regulated in application elsewhere, as in normal practise in LPG applications.